The latest version of the Better Gmail 2 Firefox add-on boasts a useful new feature: a summary panel of unread email grouped by sender, as shown above. In version 0.9 of the add-on, check off the “Summarize Unread Messages by Sender” checkbox (on the General tab) to see a listing like this one above your inbox, or any label or search result listing. Click on any name with the number of messages next to it to filter down to just those messages. 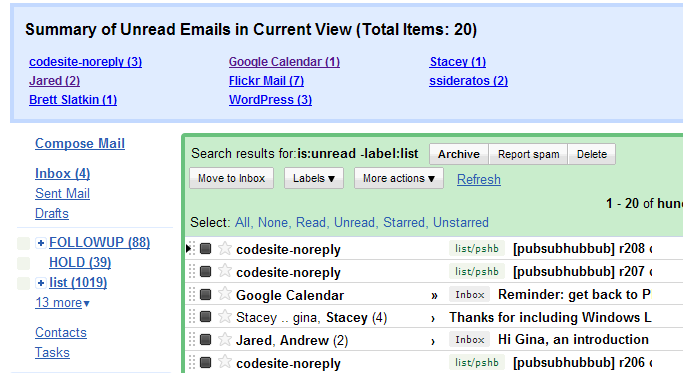 This new user script is courtesy of developer Winston Teo, who explains how he uses this grouping to clear out his Gmail inbox. Also new in version 0.9: a disabled-by-default “Support This Add-on via Amazon” option. When you opt into that feature, your purchases at Amazon kick back a small referral fee that helps support development on all the Better add-ons. Thanks in advance for your willingness to check that box. See the rest of the changelog or just download Better Gmail 2 version 0.9 here. This new script looks really useful. However, I don’t think i’ll be using it, because with filters and multiple inboxes, my real inbox is kept really clean already. I would use it if it worked on the additional inboxes, though. I closed the summary pane and can no longer open it again. On checking Winston Teo’s site, it seems there was a bug in the Firefox extension which has caused this problem. While he has updated his Greasemonkey script to fix this bug, the Better GMail 2 extension needs to be fixed. 1) I noticed a ‘+’ sign in your labels. Is this an add-on to nest labels and sublabels? If yes, can you share the name? 2) What do you use for offline GMail backup? There is http://www.gmail-backup.com, but they don’t backup labels and they seem to have stopped maintenance. @Andre: re: the + sign, that’s Folders4Gmail in Better Gmail 2. As for offline backup, I POP my email to my local computer once or twice a month. I just install this add-on, but I don’t see that option in general tab.